The Kalt Web Camera Strap (Black) is a comfortable 1.0" cotton web camera strap with quick-release lugs for easy attachment to the camera. . Box Dimensions (LxWxH) 5.197 x 3.701 x 2.205"
Web Camera Strap is rated 3.7 out of 5 by 6. Rated 5 out of 5 by Cruismile from Good quality strap I bought this particular strap made of this webbing fabric because I wanted to personalize it for a gift. It was very easy for the person to embroider a name on it, and it worked very well! Rated 5 out of 5 by CHG Canon from Perfect for an old body missing a strap I came into some old camera bodies without straps. These are perfect: plain black, standard length, strong and cheap. Rated 2 out of 5 by Baigazy from This is not a cotton! It is definitely not cotton, feels like average quality nylon. It is also very short, unusually short. Rated 4 out of 5 by Anonymous from I would buy again Looks like good quality. Easy to attach and use. A little longer would be nice. Rated 2 out of 5 by Alejandro from Hurts neck. Hurts neck after some days of extensive use on street photography (Nikon D500). I didn't want to use the original flashy one. I bought this because I don't like the "Quick Disconnect System" that others have; I consider this to be more secure and reliable. But now I have to replace it with some more comfortable, accepting the "Quick Disconnect System". How long is this strap? 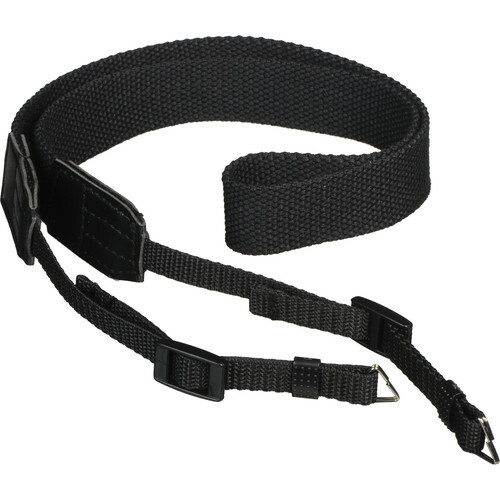 The strap is roughly 3 feet long and is adjustable. Will this fits the Panasonic Lumix ZS100?